Book: When The Ghost dog howls. I have and love this book!. 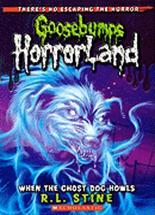 Wallpaper and background images in the Goosebumps club tagged: goosebumps. I have and love this book! This Goosebumps photo might contain anime, grappig boek, manga, cartoon, and stripboek.